What is another word for contradiction? variance, confrontation, violation, disagreement, incoherence, objection, defiance, disparity, friction, trade-off, dilemma, misinterpretation, collision, dissent, ambivalence, dispute, battle, comparison. 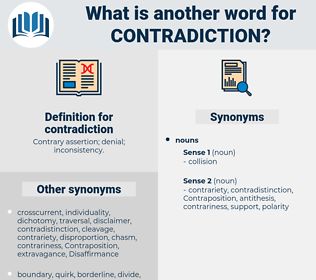 inconsistency, discrepancy, contravention, contrasts, contrary, paradox, incompatibility, controversy, dichotomy, antagonism, opposition, breach, contradistinction, clash, mismatch, tension, discord, antithesis, incompatible, divergence, conflict, opposite, contradictory, fight, struggle, counter. consistency, similarity, harmony, verification, likeness, agreement, accord, approval, peace, acceptance, concurrence, ok, sameness, Reconcilement. confession, substantiation, corroboration, admission, acknowledgment, testimony, attestation, concession, documentation, testament, validation, confirmation. He had a way of standing as though it would not be easy to move him, and a way of expressing his opinion which seemed to challenge contradiction. The apparent contradiction is due to the fact that, in this volume, the full meaning of the word " sensation" is exhibited at the outset, and sensations, as phenomena of the subjective order, are distinguished from the phenomena of the objective order which constitute the external world.